"Mediatonic Madrid" was initially intended to be the comedy name for a single engineer working from overseas. As with so many things at Mediatonic, the joke got out of hand and became... a strategic move? Barely three months after official conversations began, Mediatonic Madrid was born! Now after our first year anniversary has passed, we’re looking back at our humble beginnings. We announced the news in the summer of 2017, and the reception from the Spanish gamedev community was fantastic. 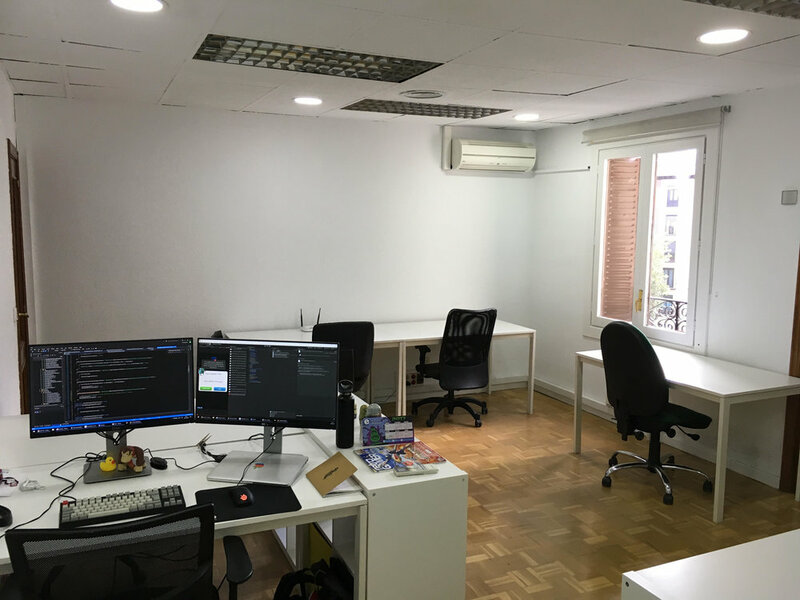 By November, our avant-garde crew started settling into our first office: a room within a coworking space in the Argüelles area, with space for five people and a TV for videocalls (well—and some lunchtime gaming—like Mario Kart 8 Deluxe on the Switch!). Since we work so closely with our London and Brighton studios, we decided to organise induction trips for all our new starters, so they could meet their UK colleagues. These trips are part work, part cultural experience. It’s important to introduce our new recruits to the Mediatonic lifestyle, so there’s plenty of time for education in Smash Bros, ping pong, pub going, and introducing everyone to one of our favourite Indian restaurants. Sometimes this even means meeting famous people like Mr Robot’s and Bohemian Rhapsody’s Rami Malek! Freddie Mercury, er… Rami was super cool with us, but we were just so nervous we didn’t know what to say! Six months in, our we’d already outgrown our new office and so we moved to a bigger, shinier space in Atocha, which included two meeting rooms, fondly named Totoro and Mononoke (we love Studio Ghibli <3). The studio filled quickly, and now there are 19 of us! During this time, we discovered that (almost) all of us have a shared love for a couple of things cachopo (probably the best dish on earth) and introducing Spanish slang within our back and forth chats to the London and Brighton offices. However, not all families are perfect and we have our disagreements: the team is divided over what chocolate-flavoured drink is best: Cola Cao or Nesquik. Time flies, and we’ve since celebrated our first anniversary. There was cake, t-shirts, and even more cake! Happy 1st anniversary, Madrid!